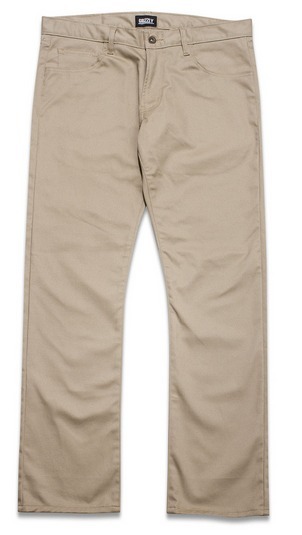 The DGK Working Man Chino Pants Khaki are a nice new pant from Dirty Ghetto Kids. This flat-front pant sits below the waist and has a slim fit through the seat and thigh with a straight leg. Made with a crisp, wrinkle-resistant poly/cotton twill work cloth, it’s woven for durability and longevity and has a stain-release finish to prevent stains from setting in. This pant has staying power with a 2-piece work pant waistband and our signature tunnel belt loops providing enhanced support for belts. Grizzly Griptape Premium Chino Pants are soooo comfortable to wear skateboarding! Get a pair and try them out for yourself! Made with durable, stretch-woven fabric, the Men’s Nike SB Pant features a built-in gusset so you can move with ease, and hidden side vents that help you cool off. To top it off, Nike SB added reflective cuff binding for night skate sessions to help you avoid the dreaded car-clip. Woven fabric offers durability and has spandex for stretch. Hidden vents at the sides have zippers to control cooling. Inseam gusset allows for a comfortable range of motion. Interior cuff binding is reflective to enhance visibility in low light. Back welt pockets offer small item storage.